(Raleigh, N.C.) – In 2013, the North Carolina State University Police Department unveiled an award-winning graphics package on its newly acquired Dodge Chargers. Originally featured in the Hendon Publishing vehicle design contest, the graphics package boldly includes elements that represent the university. These subtle cues include using the schools traditional black and red color palette, placement of the athletic logo on the quarter panel and the addition of memorial bell tower seamlessly incorporated into the patch. The particular unit used to unveil the design is one of two Dodge Chargers acquired for the agency’s traffic unit. Unlike the rest of the fleet, these units feature a slicktop package which includes a full Federal Signal lighting package, Setina pushbar and Chevrons on the rear bumper. 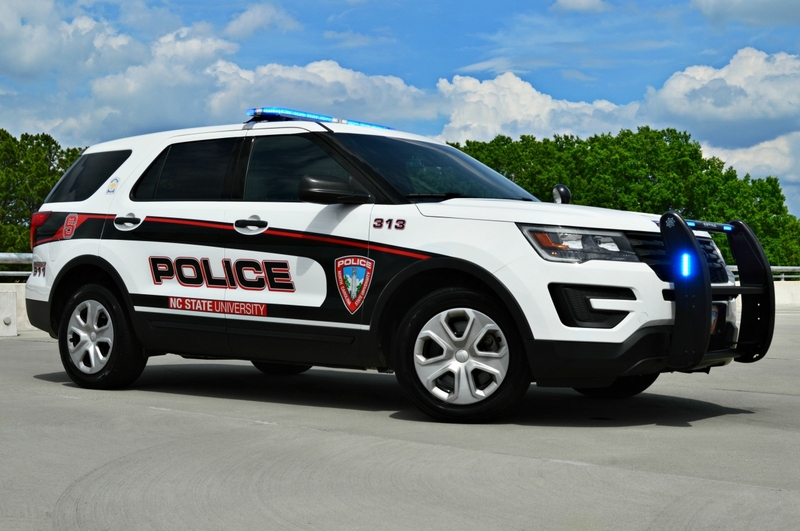 The North Carolina State University has since shifted its mainline fleet to the Ford Utility Police Pursuit Vehicle and converted to a full Whelen lighting system. The new package includes the brand new Whelen Legacy lightbar, Setina Pushbar and Whelen Ions used for secondary lighting in the pushbar and as tag lights. Since its introduction, this particular graphics package has garnered popularity throughout North Carolina. Several agencies to include the North Carolina State Capitol Police and Wake County Sheriff’s Office now also sport identical designs, though in different color tones. We certainly find it sharp and appreciate the agency taking the time to let us grab a few pictures to share. To view more creative designs and equipment packages spotted on our trips outside of the Palmetto State visit the Travel Files portion of the database.